For our 17 guest houses in Graz, we present actual room availability. Package club also attracts visitors by a rich choice of food and perfectly matched music program. In Package you can hear music of different directions, from modern compositions to classical melodies to the 80s. Fans of Latin music will simply fall in love with Cohibar Graz club, which often organizes performances of popular music bands. On Mondays the club provides its visitors with free dance lessons, so everyone is welcome to learn how to dance salsa. 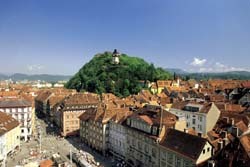 Travellers will find a lot of attractive shops and trading centers in simply each district of Graz. Visitors of Frankowitsch trading complex will surely find a lot of interesting items there. Here customers will be offered brand clothes and perfumes, and high-end jewelry. Beautiful gifts and lots of other interesting products can be easily found in Kaiser-Josef-Platz Market. Tourists usually praise Bauernmarkt am Lendplatz Market. Murpark trading center will please its visitors not only by a rich choice of trendy boutiques and jewelry, but also by numerous cozy restaurants and cafes that will make your visit to this mall even more enjoyable.